I don’t do codependence. Codependence stinks. It’s true that I want people to follow me; I’m a leader. Having people follow me is important. If nobody is following me, then I’m not leading. It’s as simple as that. 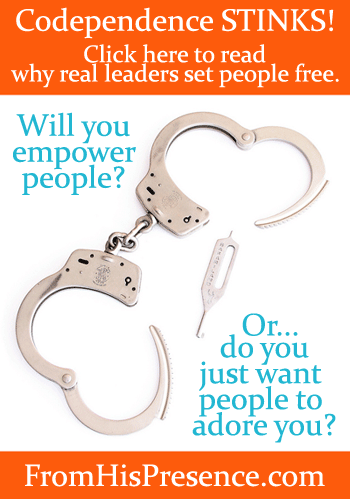 But some people think that leadership is about getting people to be codependent on them. They lead to gain adoration. They think leadership is about developing a band of groupies that hang on your every word. They want to gain popularity, recognition, and people that NEED them. That’s not leadership. That’s self-deification. True leadership is not about becoming a god in the eyes of man. True leadership is about raising other people up to walk in God’s plan for them. True leadership is about being a father. It’s been so great that it was becoming a little too much fun. I was faced with a decision: will I hold onto control of the group, so I can enjoy all this success? Will I try to keep people dependent on me, so I can enjoy their praises? Or will I purposely step back and push people up into leadership so they can grow? Ding ding ding ding ding! Score for the side of righteousness! So at this group’s next meeting, one of our leaders-in-training is going to facilitate the meeting. She’s going to teach the Word at the top of the meeting, and it’s going to be Word that she studied on her own. She’s going to make the agenda, and she’s going to oversee its execution. I’m going to help her prepare in advance, so she’ll be ready. But this is her time to shine. She’s a daughter of the King, and the Holy Spirit is raising her up. I just get to be a part, and I’m incredibly blessed to have a part in fathering this precious woman of God. I don’t do codependence. The question is, do you? Do you lead to get people to adore you? Do you lead for your own self-deification? Do you keep people under your thumb so they will always need you? Do you desire people’s worship? If you do, you’re in sin, and it’s time to repent, change your mind, and start over. Ask God for the Father’s heart. Ask God to make you a father to His kids. Ask God to help you raise people up who will go farther, faster, and have more influence than you ever will. Give your followers freedom. Empower them. Celebrate their achievements. Pump your fist in the air whenever they do something great. Cheer them on, and give them opportunities that you could keep for yourself. That is the essence of fatherhood. Codependence stinks. Fatherhood, on the other hand, is a beautiful thing. Will you be a father today? Image courtesy of The.Comedian on Flickr.